WorldCat permits searching its catalog by ISSN, by entering "issn:"+ISSN code in the query field. One can also go directly to an ISSN's record by appending it to "http://www.worldcat.org/ISSN/", e.g. http://www.worldcat.org/ISSN/1021-9749. 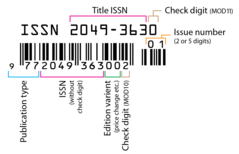 This does not query the ISSN Register itself, but rather shows whether any Worldcat library holds an item with the given ISSN. Example: the DOI name "10.1038/nature13777" can be represented as an HTTP string by http://dx.doi.org/10.1038/nature13777, and is redirected (resolved) to the current article's page; but there is no ISSN online service, like http://dx.issn.org/, to resolve the ISSN of the journal (in this sample 1476-4687), that is, a kind of http://dx.issn.org/1476-4687 redirecting to the journal's home. ^ "The ISSN for electronic media | ISSN". www.issn.org. Retrieved 2017-09-28. ^ <[email protected]>, Slawek Rozenfeld. "Using The ISSN (International Serial Standard Number) as URN (Uniform Resource Names) within an ISSN-URN Namespace". tools.ietf.org.